What impact do universities have on a country’s economy? Outlining the results of a study of universities across 78 countries, Anna Valero and John Van Reenen find that doubling the number of universities in a region increases that region’s income. They note that if the UK were to add one university to each region, national income would increase by about 0.7 per cent. In 1900, only 1 in 100 young people in the world were enrolled in universities, but over the course of the twentieth century this rose to 1 in 5. Our study finds that this enormous expansion of the higher education sector was not just the product of riches – it has helped fuel economic growth. We compiled new data based on UNESCO’s World Higher Education Database detailing the location of 15,000 universities in 1,500 sub-national regions across 78 countries over the period 1950 to 2010. On average, doubling the number of universities in a region increases that region’s subsequent income by over four per cent. There are also spillover effects to other regions in the same country, creating a growth multiplier. The first modern university was founded in 1088, in Bologna. It was an innovation from the religion-based institutions that had come before: a community with administrative autonomy, courses of study, publicly recognised degrees and research objectives. Since then, universities have spread worldwide (see Figure 1) in broadly the same form. Economic historians have argued that universities were an important force in the Commercial Revolution through the development of legal institutions and also the Industrial Revolution through their role in building and disseminating knowledge. The focus of our analysis is the period since 1950 when university growth was particularly rapid (see Figure 1). Post World War II, there was a new view that higher education is essential for economic and social progress. This contrasted to the pre-War fears of “over-education” that were prevalent in many countries, should enrolments extend beyond limited sets of national elites. Source: WHED. Dates marked when the number of universities in the world doubled. There is ample evidence that higher education pays off for the individual as wages of graduates are much higher than those of non-graduates. Proving the link between human capital and economic growth at the country level is harder because there are many factors to control for, but the literature generally finds a positive relationship. We look at sub-national data at the regional level (e.g. US states) and find that increases in university numbers significantly raise future GDP per person, a result that is robust to controlling for population and geographical factors. Moreover, universities increase output not only in their own region but also in neighbouring areas. Doubling the universities in one region increases that region’s income by four per cent and country-wide income by 0.5 per cent. Not all universities are equal – they vary in both quality and size. For example, we find that research oriented universities in technologically advanced economies seem to matter more for growth. Policy makers are not only interested in the potential benefits of universities, but also in the costs of building and maintaining them. In the UK we estimate that if one university were added to each of its ten regions this would lead to about 0.7 per cent higher national income (£11.3 billion based on 2010 figures). This is higher than the likely annual cost, which based on average university expenditure is more like £1.6 billion. The large margin between benefits and costs suggests university expansion is beneficial. How do universities affect growth? A cynic might claim that universities affect growth in a mechanical way: more people move to the region, and consume more “essentials” there – housing, beer and night clubs services spring to mind. But our results remain even when we control for population growth. The magnitude of the effects is much too large for a demand side explanation. We do find, however, that the university effect seems to be related to increasing the supply of skilled graduates who raise productivity in the firms they work in. 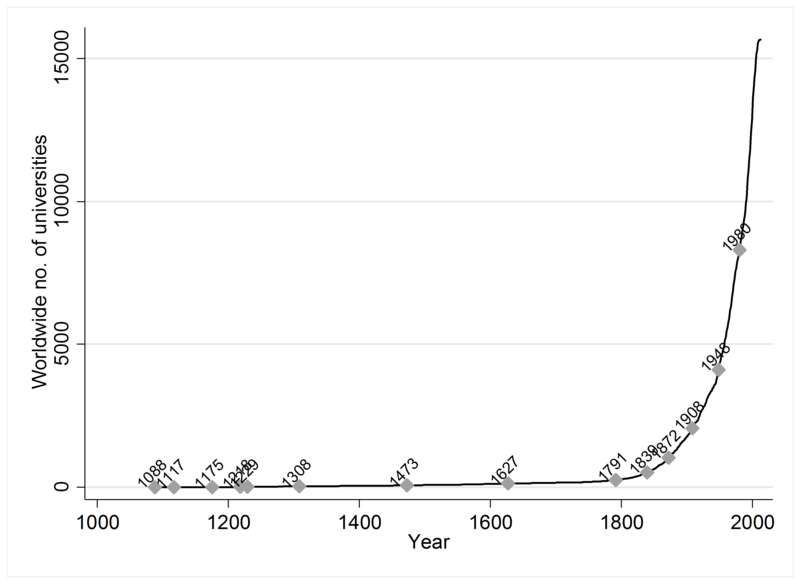 We also find that universities boost innovation (as measured by an increase in patenting). Over a longer time frame, we also find that higher university presence in a region is also associated with pro-democracy views amongst individuals. The interesting thing about this result is that it persists even when we control for the individual’s own education, suggesting there could be some kind of externality associated with universities through the diffusion of ideas into their surrounding areas. International data since the 1950s shows that universities matter for growth, and using the UK as an example, we estimate that the benefits outweigh the costs. The UK government recently announced measures to encourage the entry of more universities. Assuming that any new institutions have the same qualities as those we already have, our analysis suggests this policy would be good for growth. Anna Valero is an Economics PhD candidate at the LSE, and Research Economist at the Centre for Economic Performance, on the growth programme. Her work is focused on firm organisation and workforce skills, and their effects on productivity and innovation. More generally, Anna is interested in understanding UK economic performance, the drivers of growth and implications for policy. Before resuming her studies, Anna was at Deloitte for a number of years where she was a Manager in the Economic Consulting practice and qualified as a Chartered Accountant. John Van Reenen is a Professor in the Department of Economics and Director of LSE’s Centre for Economic Performance. He received the European Economic Association’s Yrjö Jahnsson Award In 2009 (jointly with Fabrizio Zilibotti), as the best economist in Europe under the age of 45. In 2011 he was awarded the Arrow Prize for the best paper in the field of health economics. His research focuses on the causes and consequences of innovation, the measurement of management practices and their impact on productivity across firms and countries.